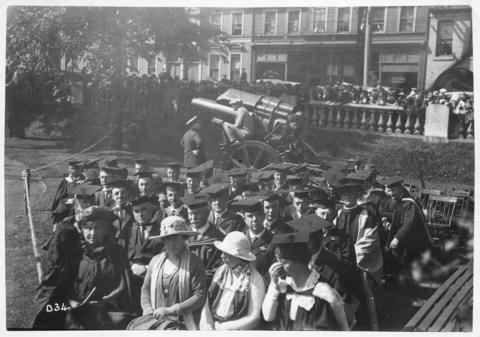 Item is a photograph taken during a Dalhousie University reunion in 1924. The photograph shows a group of unidentified people wearing academic dress who are sitting in rows of chairs on the Grande Parade in downtown Halifax. A large piece of mechanical equipment is positioned behind them and there is a crowd watching from behind a fence.